Courtesy of the kindness and generosity of Ken Glass I have been able to examine the new Special Hobby 'Oscar' kit in 1/72nd scale. This is very much an "in-box" review as I have not had the opportunity even to test fit the parts. The kit comes in a robust, and huge for the model (12" x 8" x 2"), top opening box in Special Hobby's attractive new design. It is marketed as a "Limited Edition" Ki-43-II Ko but actually represents what Aero Detail 29 identifies as a 'Model II Mid-Production' type and James I Long records as a Ki-43-IIa or 'Ko' Late type. The designators 'Ko', 'Otsu', 'Hei', etc., (approximately equating to 'a', 'b', 'c' in meaning and intention) were more usually associated with armament changes and their usage for the Hayabusa II series lineage is not universally agreed. On opening the box one is immediately struck by the similarity of the parts breakdown to the Hasegawa kit from 1982. There are four sprue frames, three in mid-grey plastic and one transparent. The main frame which fits the box contains wings, tailplanes and most of the detail parts, two smaller frames contain the two fuselage halves and the engine cowling, oil cooler parts and exhausts respectively and finally a transparent frame contains the canopy parts and leading edge landing light transparency. The surface detail is light and delicately engraved. Although the fabric flying surfaces reveal the underlying metal framework in "shrink-wrap" style rather than a true representation of doped fabric tautened over the frame with rib tapes added it is not as exaggerated as on some other kits and should look fine under paint. The plastic seems less "rubbery" and vinyl-like than on some MPM/Special Hobby kits, which is welcome, but it remains to be seen how it behaves with glue. There is a moderate amount of 'flash' on some of the parts and, probably due to moulding considerations, some of it is in unwelcome places. For example on the delicate undercarriage legs the flash is on the more visible forward and rear faces and may be difficult to remove from the concertina oleo boot. There are absolutely no resin or photo-etch parts in this kit. It is all plastic which for this reviewer is fine but others may be disappointed especially when considering the price. The instruction sheet advises that a separate photo-etch sheet of detail parts is available from MPM as catalogue # K72001 - and from the small illustration this seems to be pre-painted. It does not appear to be listed there yet though. Interior detail consists of representative framing on the fuselage halves (an improvement on the Hasegawa kit) and a nine part interior - floor, seat back and pan, control stick, rudder pedals, instrument panel with engraved detail, sidewall fuel gauge panel, oxygen bottle and gunsight. Perfectly adequate for the scale especially given the size of the cockpit aperture. The cowling is in three parts with two separate side panels that appear to capture well the slightly bulbous appearance of the original in plan. The engine is a half-moulding, like the Hasegawa kit, and the detail looks a little heavy handed and crude on this. The oil cooler is in three parts and superior in shape and form to the Hasegawa kit. The inclusion of the earlier, smaller oil cooler suggests there may be further kits to come and it will be interesting to see if Special Hobby eventually release the first true kit of the Ki-43-II early production aircraft. The exhaust pipes are the early, non-thrust type but are much better than those in the Hasegawa kit which depicted the outlets as round "tubes". The kit contains both early and late style drop tanks, together with racks and shackles, but there are no locating holes or marks in the wings for these - they have to be "measured in". The kit instructions refer to fixing the later style tanks in the positions outboard of the undercarriage which are only applicable to the II series late production types. The wing leading edge landing light is also only applicable to late type Hayabusa II so Special Hobby seem to have become a little confused over their variants. These are relatively simple fixes, especially as the early drop tanks are included, but the absence of thrust type exhausts limits the flexibility of the kit. Hasegawa to the rescue as the thrust exhausts are optional in that kit - rather ironic. Both types of cockpit headrests are included with the larger type marked "not for use". The upper wing includes interesting cutouts for the mechanism of the "butterfly" combat flaps which are molded to the single-piece lower wing, but the flaps are not depicted as separate components and are not much of an improvement over the poorly represented Hasegawa flaps. The canopy is in two parts so that it may be presented open - a nice touch. The airscrew unit is a surprising throwback to the technology of earlier kits and consists of a spinner with recesses that fits over the propeller - there is no back plate. The undercarriage fairings are reasonable, with framework detail on the inner face but SH have replicated Hasegawa's crude design in depicting the upper fairings as heavy right angled "flanges" rather than the thin hinged extensions that they were in reality. Unfortunately the "not for use" parts do not include a fuel cooler. 1. A Ki-43-II Ko of the 33rd Sentai's 2nd Chutai in New Guinea, "white 5", which is usefully the subject of a colour photograph. SH suggest dense green mottle over natural metal but the base finish could be light grey. 2. A Ki-43-II Ko of the 47th Sentai's 1st Chutai in Japan, "white 36", with Homeland Defence bands. 3. A Ki-43-II Ko said to be of the 63rd Sentai's 3rd Chutai in New Guinea, "yellow 02". This tail marking has never been satisfactorily explained and has been depicted in various ways over the years. In the original photograph the rudder fabric is missing so the actual design cannot be discerned. Personally I have my doubts that this is a 63rd Sentai aircraft and think that it may be from the 33rd Sentai - but even then the visible part of the tail marking is not quite right for that unit either. 4. Ki-43-II Ko of the 77th Sentai's 1st Chutai in New Guinea. The small decal sheet, with wing Hinomaru for one example but two designs of fuselage Hinomaru, one with white outline and one without, is printed by 'DEAD Design'. Colour and saturation look good and a very nice touch is the provision of stencilling which includes full markings for the droptanks too. SH suggest that the drop tanks on all these options are painted yellow but go here for other possibilities. What you get is a mid-production II Series Hayabusa which SH suggest you put late production droptanks and a landing light on. The parts for early droptanks and a late production cockpit headrest are included - but not for the thrust type exhausts. It is possible late type drop tanks and landing lights were retro-fitted to earlier machines - I haven't made a study of that from photographs. Provided care is taken over these details and the actual configuration of the machine to be modelled is checked these anomalies should present no problem. In the interim the thrust type exhausts may be taken from the earlier Hasegawa kit to build a late production II. Whilst the kit does contain the early style oil cooler there is no annular cooler for the engine and the wings are the reduced span type so an early production II cannot be built from it out of the box. Overall shape and dimensions appear OK - although I have not checked them in detail against plans - which plans?! The kit does not appear to incorporate the strange "broken-back" effect which marred the Hasegawa 1/48th and Fujimi 1/72nd models although the line from cowling to cockpit and cockpit to tail does change angle slightly. This kit, notwithstanding a build test, appears to be a definite improvement over the 27 years old Hasegawa version, especially for those who prefer engraved rather than raised detail. But I venture it is not a quantum improvement and comes at a relatively high price. I will post images of the sprue frames and decals later. Thanks for the review- Hayabusa variants are indeed a maze. I am thinking that the late style drop tanks were the type that mounted outboard of the landing gear legs, the early style inboard of the gear legs. If so, the mounting points were plumbed internally and not easily converted when the new items were produced. I am at work and do not have my books- I think that the Aero Detail volume has definitive info on this? It is such a pity that the 1/48 Hasegawa kit was such a disappointment in so many ways- IMHO the worst modern kit from that company by far. Great Review!! I am looking forward to the other Ki-43 kits that are to be released in the future by SpecialHobby/MPM. 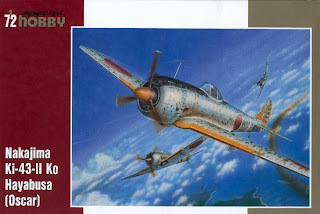 By the way the Eduard photoetched set for the Fujimi Ki-43I might have many parts that can be used on later Ki-43 variants.